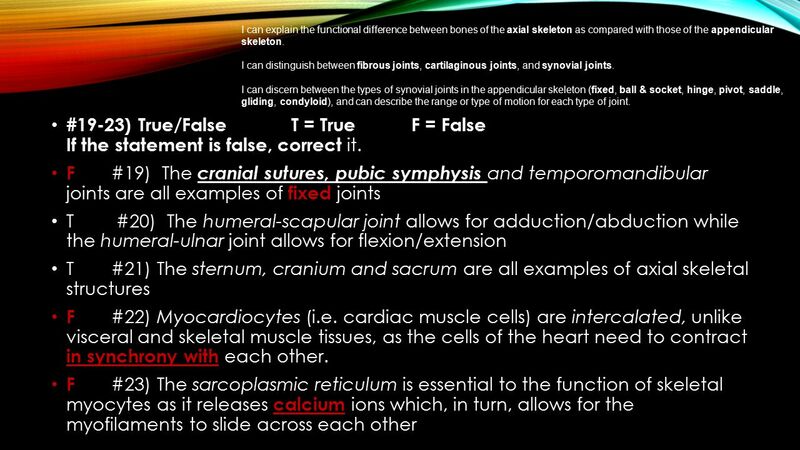 8 I can describe the physiological function of cartilage in the endoskeleton, and I Can provide examples of where one would find hyaline (articular) cartilage in the human body. 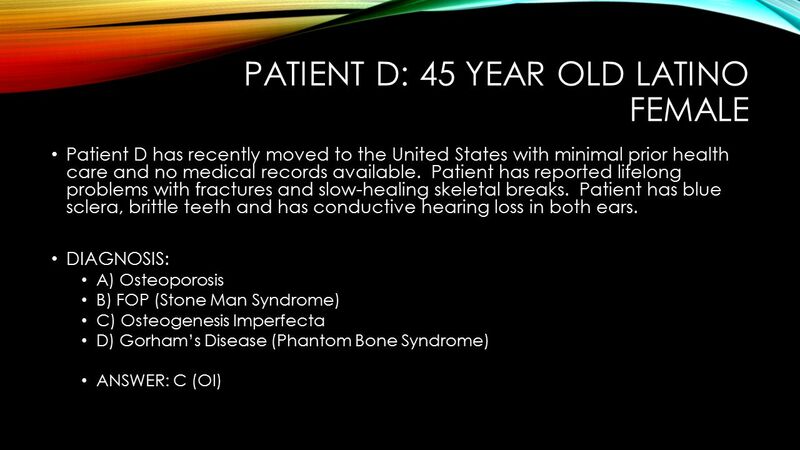 #2) What type of cartilage would you expect to find at the pubic symphysis? Why? 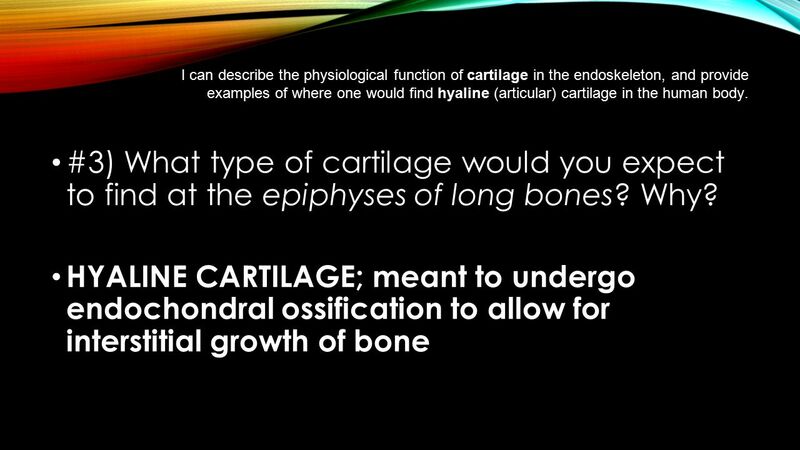 Fibrous cartilage; not supposed to ossify. Meant to stretch but not tear. 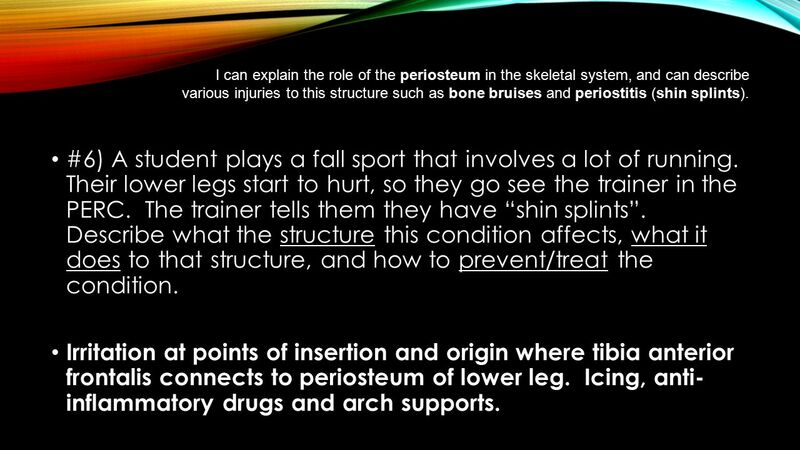 12 I can explain the role of the periosteum in the skeletal system, and can describe various injuries to this structure such as bone bruises and periostitis (shin splints). #6) A student plays a fall sport that involves a lot of running. Their lower legs start to hurt, so they go see the trainer in the PERC. The trainer tells them they have “shin splints”. 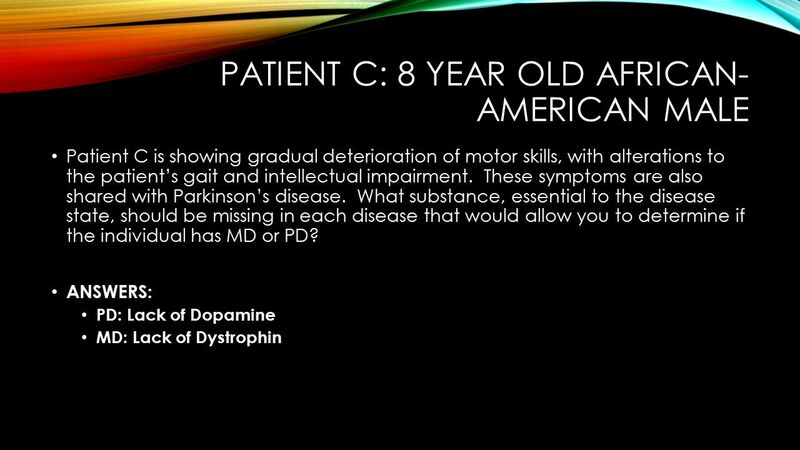 Describe what the structure this condition affects, what it does to that structure, and how to prevent/treat the condition. Irritation at points of insertion and origin where tibia anterior frontalis connects to periosteum of lower leg. Icing, anti- inflammatory drugs and arch supports. 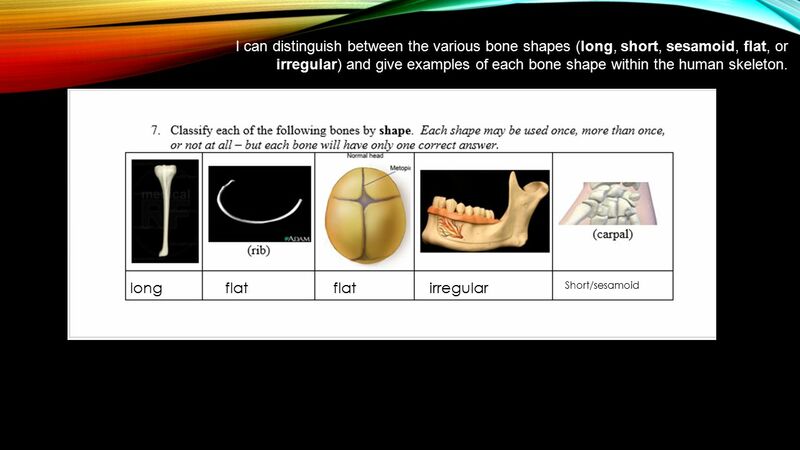 14 I can distinguish between the various bone shapes (long, short, sesamoid, flat, or irregular) and give examples of each bone shape within the human skeleton. 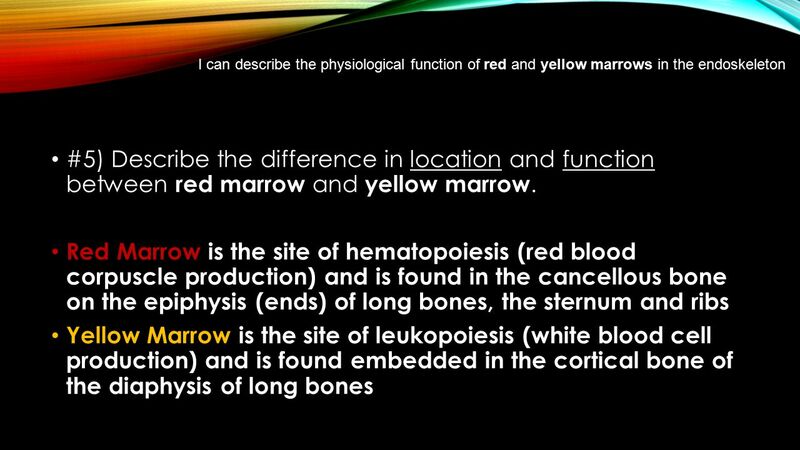 15 I can describe the following processes that occur in the skeletal system, and the role of hormones, osteoblasts, and/or osteoclasts in each process. 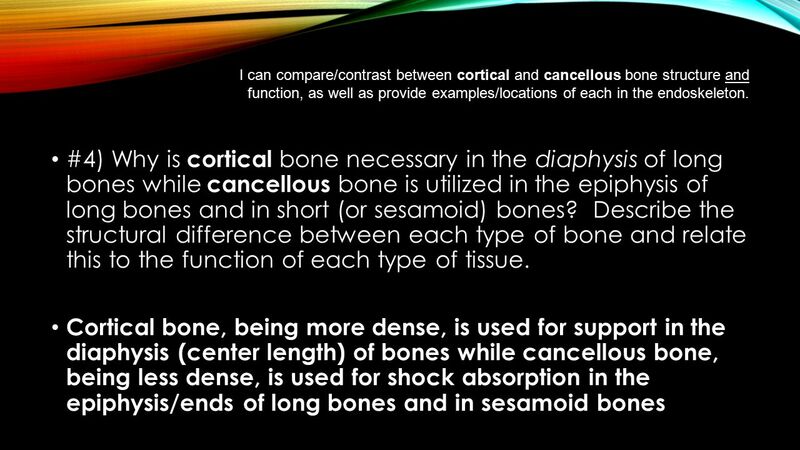 Bone formation (ossification) Bone growth, at epiphyseal plates (length) and diaphysis (width) #9) Why is it important for young children to wear wrist guards when roller blading? 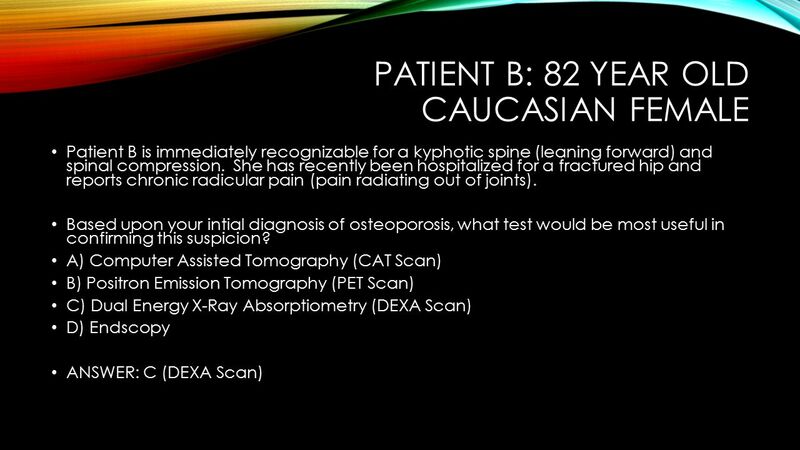 Explain in terms of epiphyseal plates, endochondral ossification and interstitial growth. 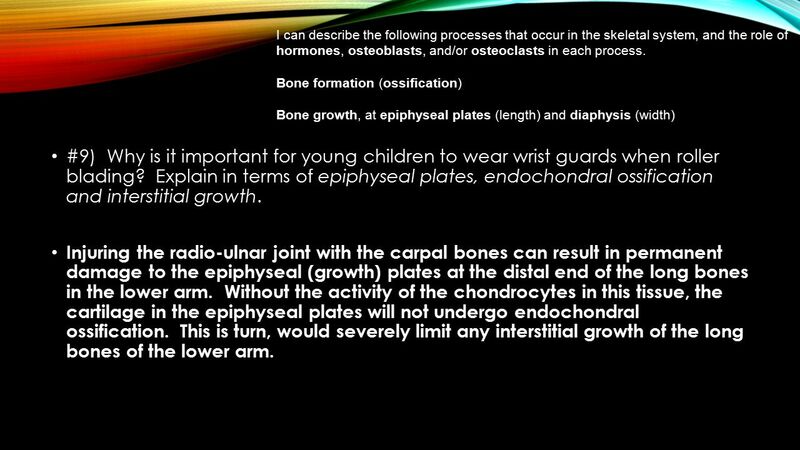 Injuring the radio-ulnar joint with the carpal bones can result in permanent damage to the epiphyseal (growth) plates at the distal end of the long bones in the lower arm. Without the activity of the chondrocytes in this tissue, the cartilage in the epiphyseal plates will not undergo endochondral ossification. This is turn, would severely limit any interstitial growth of the long bones of the lower arm. 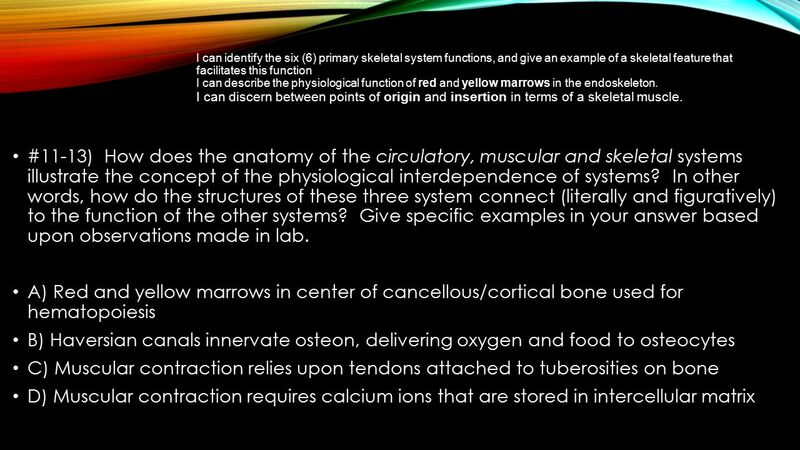 16 I can describe the following processes that occur in the skeletal system, and the role of hormones, osteoblasts, and/or osteoclasts in each process. 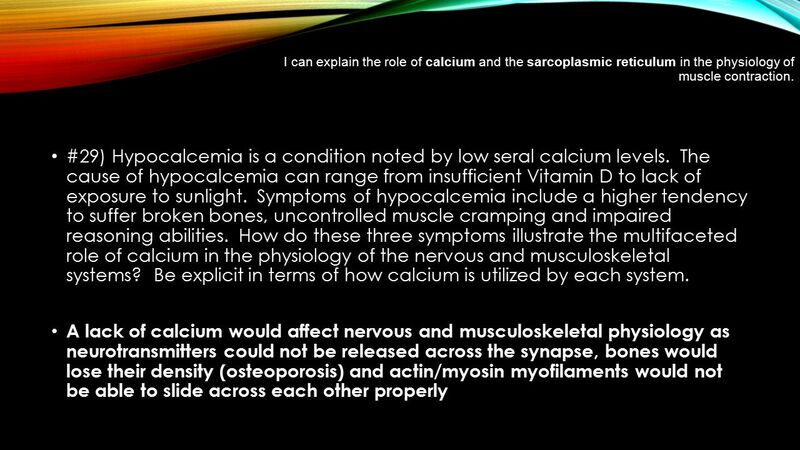 Bone formation (ossification) Bone growth, at epiphyseal plates (length) and diaphysis (width) Bone remodeling (in response to seral calcium levels and bone stress/force of gravity) I can predict the effect of high seral calcium levels or bone stress and the effect of low seral calcium levels or bone stress, and how this can lead to osteoporosis or bone wasting (atrophy). #10) One of the difficulties in planning for a prolonged space flight (i.e. a mission to Mars) concerns the preservation of the astronauts’ muscloskeletal anatomy. 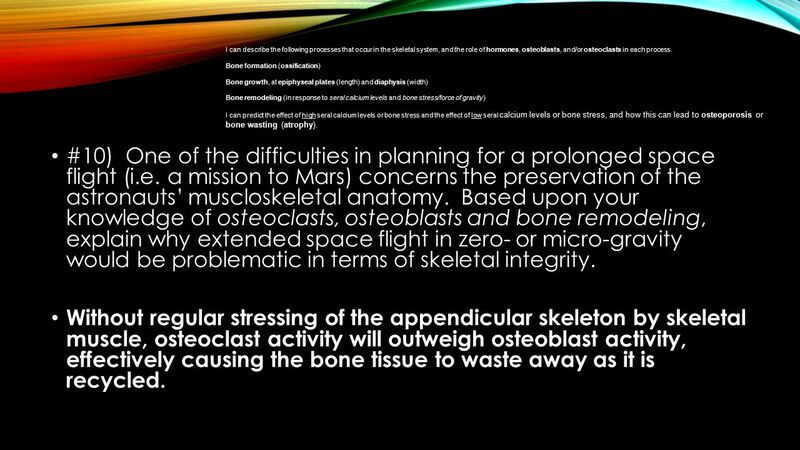 Based upon your knowledge of osteoclasts, osteoblasts and bone remodeling, explain why extended space flight in zero- or micro-gravity would be problematic in terms of skeletal integrity. 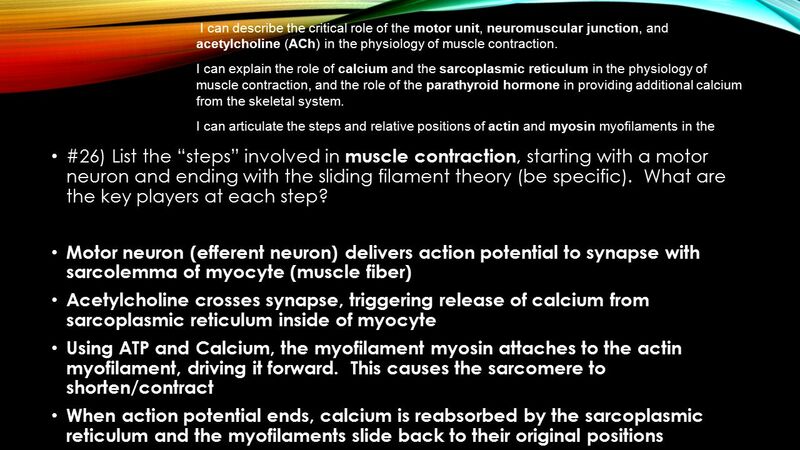 Without regular stressing of the appendicular skeleton by skeletal muscle, osteoclast activity will outweigh osteoblast activity, effectively causing the bone tissue to waste away as it is recycled. 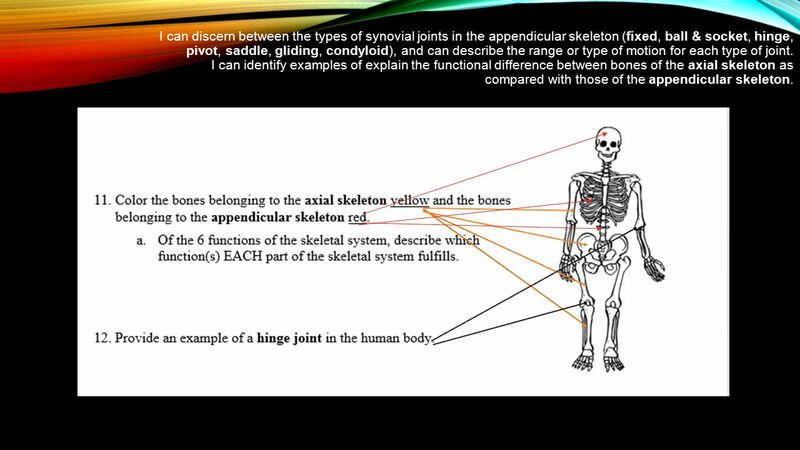 17 I can discern between the types of synovial joints in the appendicular skeleton (fixed, ball & socket, hinge, pivot, saddle, gliding, condyloid), and can describe the range or type of motion for each type of joint. 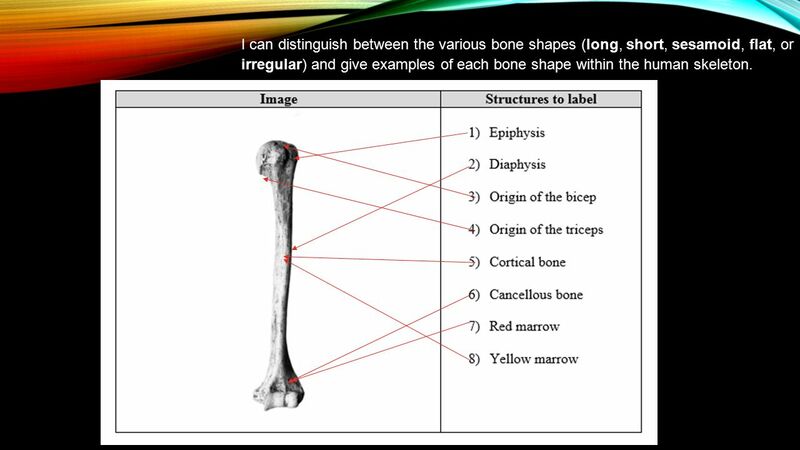 I can identify examples of explain the functional difference between bones of the axial skeleton as compared with those of the appendicular skeleton. 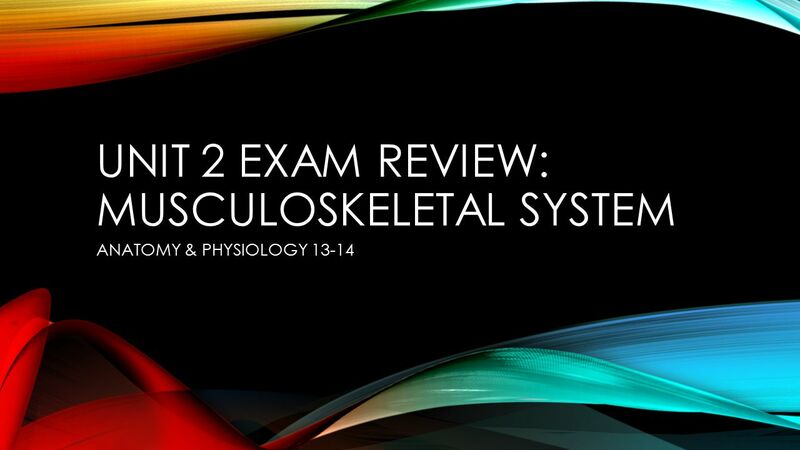 29 I can explain the role of the periosteum in the skeletal system, and distinguish between a bone bruise and periostitis (shin splints). 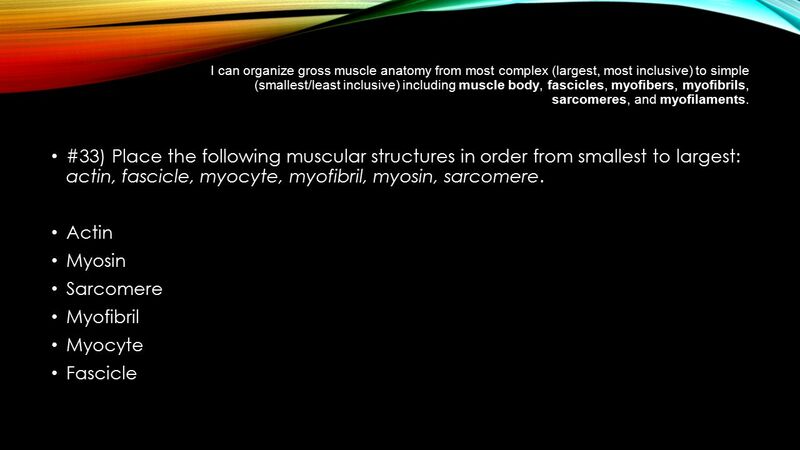 I can organize gross muscle anatomy from most complex (largest, most inclusive) to simple (smallest/least inclusive) including muscle body, fascicles, myofibers, myofibrils, sarcomeres, and myofilaments #31-32) The suffix “-itis” means “inflammation”. This suffix may be appended to any structure that has become swollen or inflamed (i.e. 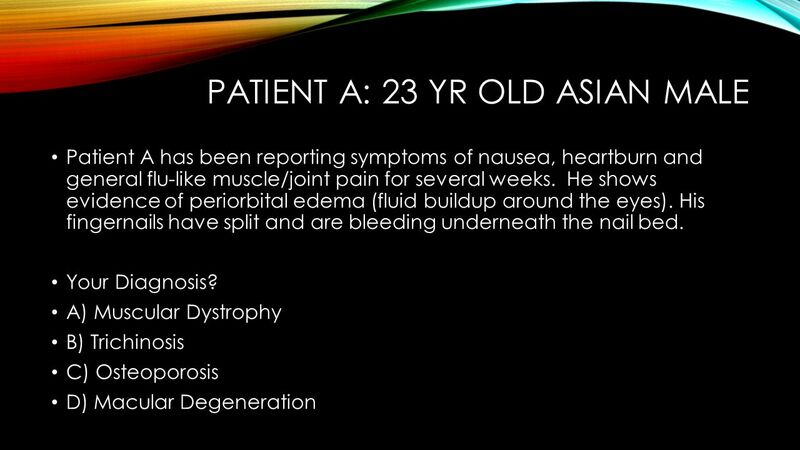 meningitis, peritonitis, gastroenteritis, etc). What, then, is the physiological difference between plantar fasciitis and periostitis? 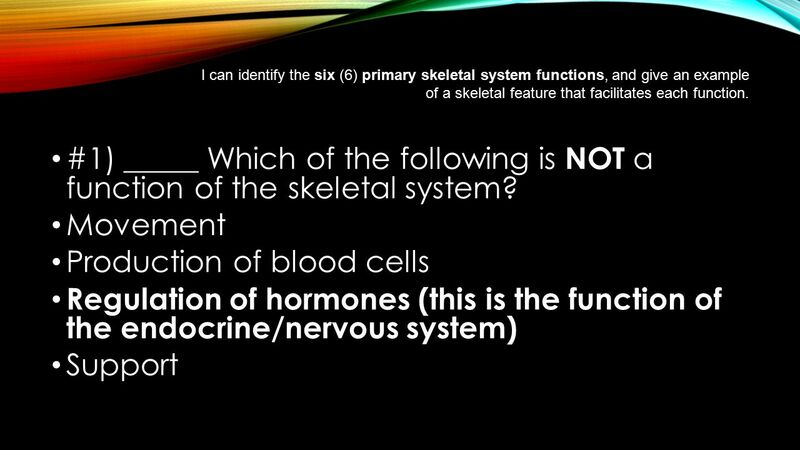 Hint: The former afflicts the muscular system while the latter afflicts the skeletal system. Plantar fasciitis is inflammation of the fascia covering the flexor digitorum brevis muscle between the calcaneous (heel) and tarsal bones of the foot. 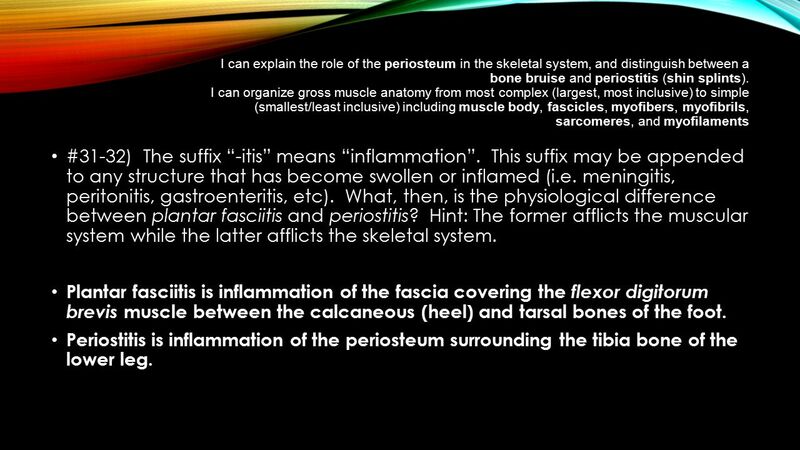 Periostitis is inflammation of the periosteum surrounding the tibia bone of the lower leg. 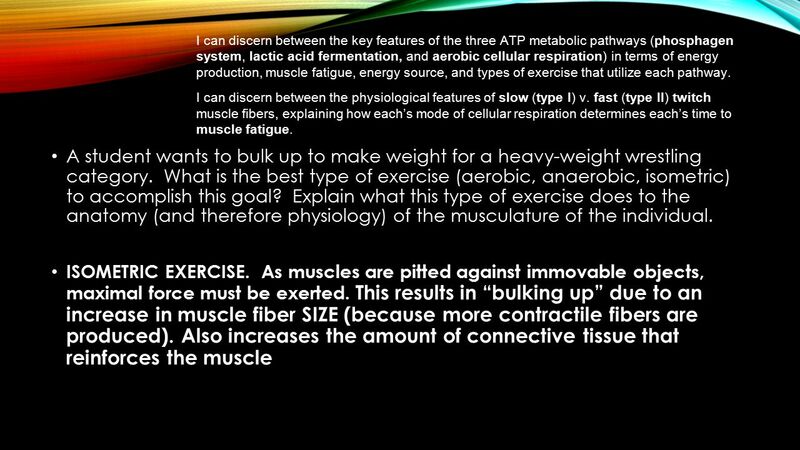 Download ppt "Unit 2 Exam Review: Musculoskeletal SYstem"
Muscles and Movement IB Biology. 36–1 The Skeletal System Photo Credit: © Getty Images. 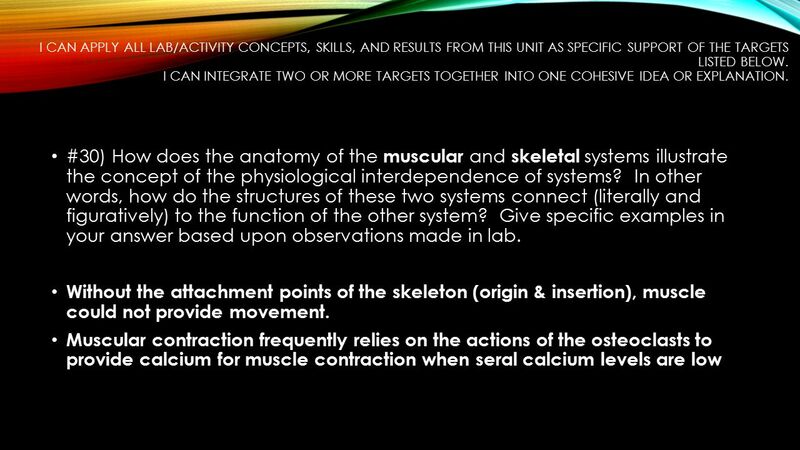 Muscular and Skeletal System Powerpoint #2 Unit 8 – Chapters 35/36 Working together to create movement. Ch. 11 pg 290. 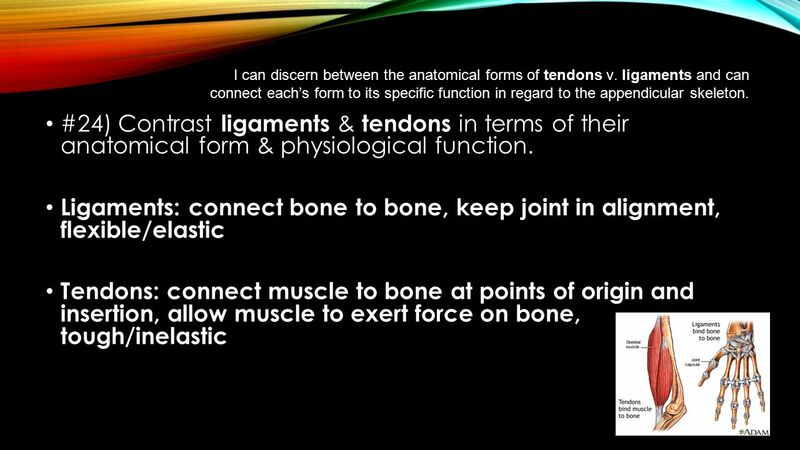 The movement in humans involves bones, ligaments, muscles, tendons and nerves. 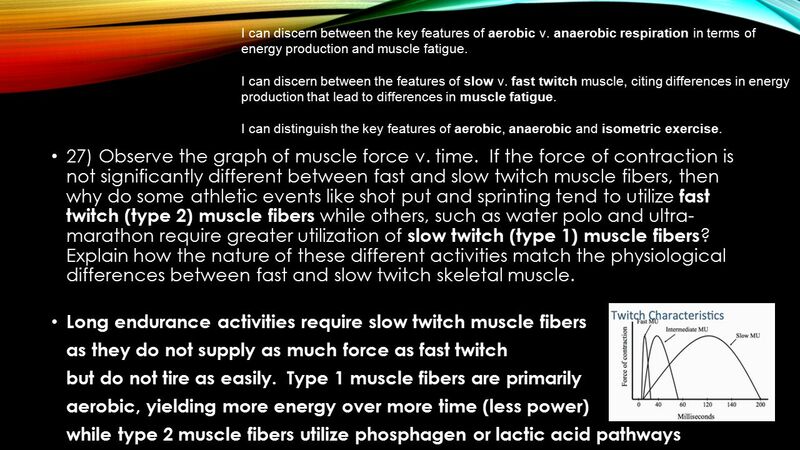 Musculo-Skeletal System Muscles + Bones = Locomotion. 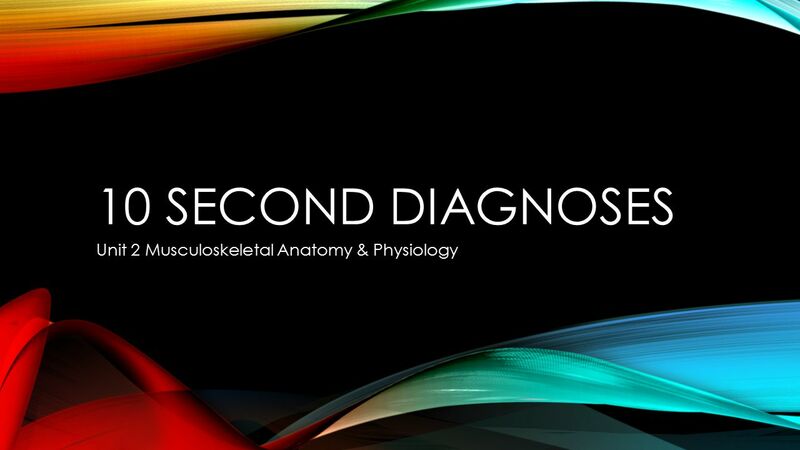 KEY CONCEPT The skeletal system includes bones and tissues that are important for supporting, protecting, and moving your body. 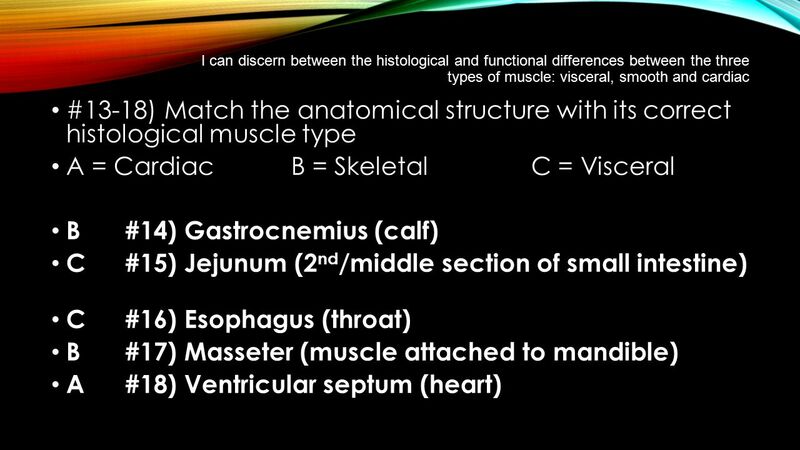 Musculoskeletal System. 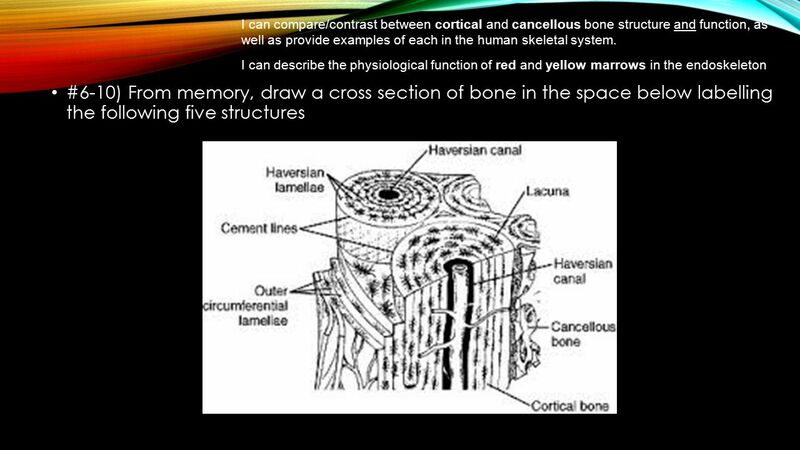 Common names Vocabulary Lesson 2 1. skeleton – the framework of connected bones in your body 2. bone – is an organ of the skeletal.